You can run a saved report at any time. You can also run a report to test the configuration of a report in progress. •Click Report > Run Report and select the report name. •Select Reports (or a reports folder) on the main console tree, right-click a report and select Open and Run Report (or press Ctrl+F5). •In the the Report window while defining a report, click Run Report in the toolbar (or press F5). 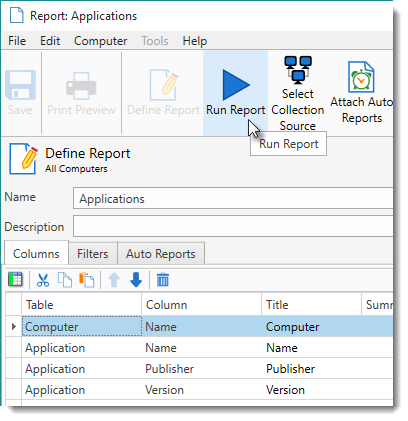 •In the the Report window while defining a report, click File > Run Report (or press F5).